When I was a yoot, we had our own colloquialisms of the day. We didn't hurry, we booked. You didn't get sick, you ralphed. Overly excited people were spazs. After a long day, you just wanted to veg out. Cool stuff was gnarly, fresh or rad. Bad stuff was heinous, grody or bogus. Just like the terms nowadays make no sense to us, our parents thought we, as teens, were L7s. Today, as a parent, I have to deal with cray, YOLO, swag, whatevs, douche....the list goes on. It's only for the amazing-ness of this post that I use "swag", a term only less hated because of the creation of YOLO. Basically, kids today are dorks. But a little background. Thursdays, I head into the office. I drive me wife to her job (school) and head off to mine. Then, on the trip home, I pick her up. Simple. On the rare occasion, a coworker will take her home. Yesterday was one of those rare days, which couldn't have been better timed. I had my yearly performance review, so I left work 30 minutes later than normal. Luckily, my wife left me a phone message that she had a ride and not to bother picking her up. Ok, instead I will head directly to pick up my daughter from her job. She is having some car issues right now, and her work is right along the path home. Because of the rain yesterday, I didn't get off the expressway until 5pm. Daughter is picked up at 6. It's still a good 15 minutes from the exit to my house, so I would really just get home for maybe 20 minutes before I would have to head back out. Better to just go get her directly, but how to waste a half hour? By sheer luck, my LCS is RIGHT OFF the expressway. So I was forced to go there to blow of time. Yes - FORCED! I figured I would price out some Fox vintage and maybe pick up a couple things. Well, Fox stuff isn't cheap, at least the quality my shop had was too high to warrant me purchasing any cards. I don't need fresh out of the pack cards. So I spent time digging through a few other boxes, grabbed some vintage Aparicio and a box of '92 UD junk wax to rip ($12). Heading back down to the packs, I picked up another jumbo of 2014 (I'm an idiot). Jeff, behind the counter, knows I am a hockey guy and mentioned Upper Deck SPx just came out. Ten bucks a pack. I usually buy a few higher end packs of hockey during the season. I made mention that I will probably pull some nobody relic, cuz I always do. 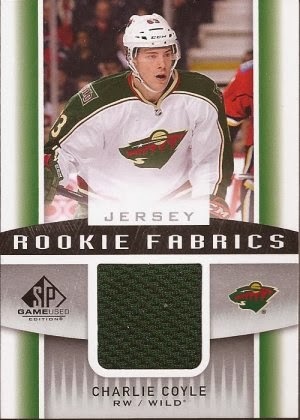 My pack of SP Game Used from the week prior is a prime example. No pushing! No shoving!!!!! LINE FORMS TO THE LEFT! Yeah, quite unspectacular. But still, with my good raise and bonus, I'm going for a pack of SPx. Even without those, I would get a pack. So I picked my poison and checked out. I always like ripping the higher end packs in store. When I ripped, it was kind of weird. The other clerk behind the counter noticed, just at the time I did, there was a card already in a penny sleeve in the pack. So I got a hit. Oh boy, did I get a hit. On card buy back autograph of the Great One, numbered to 24. It's a buy back of the 1996 SPx hologram cards. The card was in a penny sleeve so the COA would not get lost. I can say I have loved blogging, because along with acting like an idiot, I get to share in everyone's spoils, and get only the slightest twinge of jealousy at the monster hits. Now I have a monster of my own. "Uhhhh, whut is a 'yoot?'" Congrats on the amazing pull! That's an awesome card!!! Congrats! WOW WOW WOW, Amazing Gretzky! Congrats! Next time we work out a trade, I'd be interested in that Coyle. :) I was a fan of his when he was with Saint John. Wow! 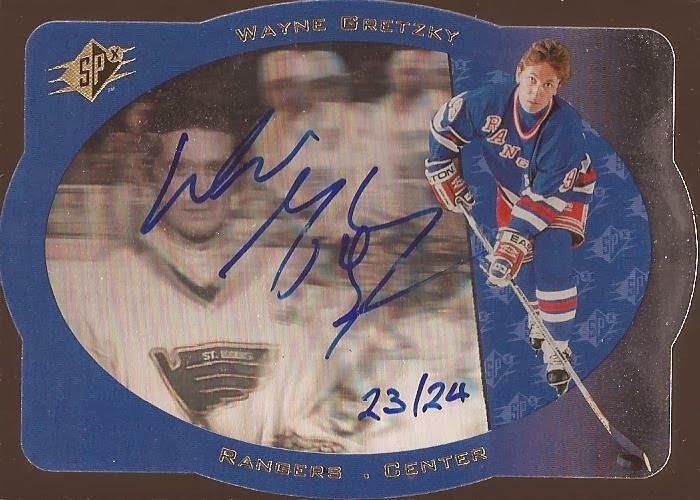 As an NYR fan for life a Gretzky as a Ranger auto is about as good as it could get for me. Congratulations! Kate and I are impressed. Fantastic pull, man. Of all the cards I have, a Gretzky auto has still eluded me. Congrats!!! What a perfect twist of fate, FORCED to pick up a gretzky auto for 10 bucks! Congrats! That's an awful shame to be forced into pulling something like that.